As we approach the end of the first year of President Trump’s presidency, perhaps no topic has generated greater headlines or had greater practical impacts than the President’s actual, proposed, and likely further changes to the immigration system. Programs like Deferred Action for Childhood Arrivals (DACA),the International Entrepreneur Rule (IER), the H-4 visa, or extended Optional Practical Training (OPT) for Science, Technology, Education, and Math (STEM) students have either been terminated, are in the process of being terminated or widely expected to be terminated in the coming months. What does this mean for San Francisco? How will this impact our city? How will this impact our education systems? How will this impact the tech industry? 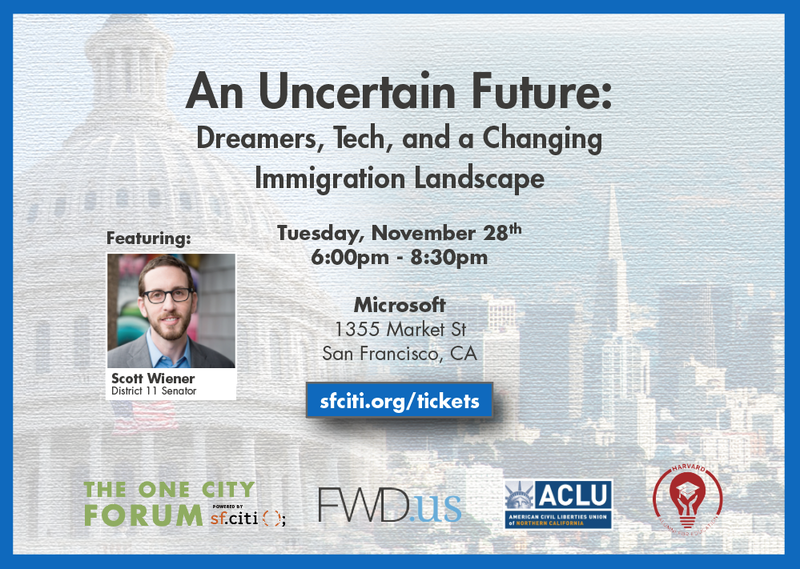 Join sf.citi, FWD.us, the ACLU of Northern California, Harvard Alumni for Education, and industry leaders for a night of cocktails and conversation on the current status of immigration reform in DC and how these changes are affecting the tech industry and Bay Area immigrants. View the full event details here.